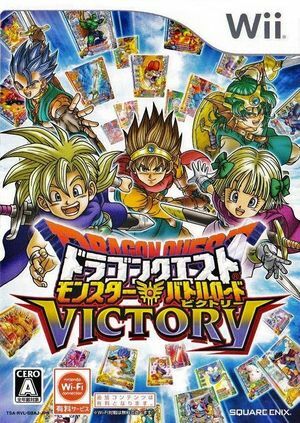 A home conversion of the hit arcade RPG title, Dragon Quest Monsters: Battle Road Victory lets players use cards to summon Dragon Quest monsters out onto the battle field. The Wii version includes four way local multiplayer support as well as Wi-Fi Connection support for online battles. The Wii version will also be seeing a new Tournament Mode. As an added bonus, Square Enix has even come up with a way of replicating the card scanning feature of the arcade version. DSi owners will be able to download a "Color Code Scanner" app via DSi Ware. This paid app can be used to scan current arcade version cards into the Wii title. The graph below charts the compatibility with Dragon Quest Monsters: Battle Road Victory since Dolphin's 2.0 release, listing revisions only where a compatibility change occurred. This page was last edited on 7 January 2018, at 10:31.